I have had it! 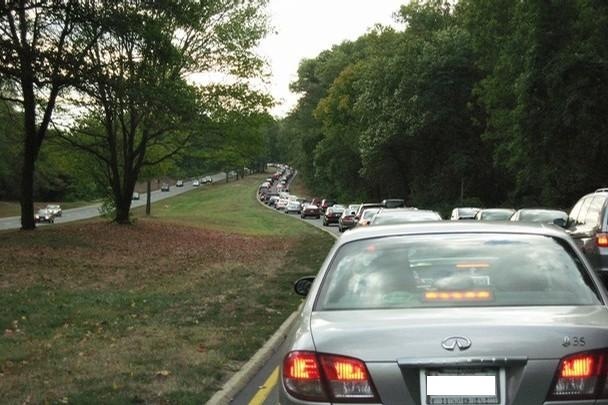 The traffic situation in Northern Virginia is out of control. Two-hour long commutes to go 40-miles is ridiculous; well, 40-mile commute are just ridiculous to start with. Most would argue that living closer to work and school would be the ultimate solution to cutting out the congestion on our roads. I say that is an impossibility. The fact of the matter is most of the commuters in the Northern Virginia suburbs around Washington, D.C. commute because they wanted to buy a home. Did you know that although the housing crunch has affected the area around Washington, D.C., we have by far retained more house value and somewhat maintained home sales (new and re-sale)? The housing market in Northern Virginia is more stable then the rest of the US. And why is that. The Washington, D.C. are is maintained by government jobs (state, local and federal), military, and the tech industry. Basically, if you want a job and can’t find one, come here. But there’s the rub. Even though this area makes more money then most of this country, it also pays over inflated housing costs due to limited supply and high demand (basic economics). So for even the above average family ($100,000 – $200,000/year) to buy home, you can forget about living close to where you work. For example, in 2006 the Estimates of Median Household Income and Median Family Income in Fairfax County, Virginia was $100,300 with a median family income of $119,800. Now that sounds like a lot, but look at the distribution of wealth. Nearly 50% of the population made less then $100,000. Put together with the average home price ($675,000 on 10 Sep 2008) one can see that even above average families would struggle. Now contrast that with the average price of a home sold in Stafford County, Virginia (about 40 miles south of Washington, D.C.). In 2005 the average cost of a home was $543,022. Although still high, all in all, a bargain compared with farther north. So it made sense, make the money, but move to where its less expensive to live. Sure its a drive, but we’ll manage, right? Wrong. The problem with these long commutes everyday is that people just don’t know how to drive. (This is where I’m starting to rant) I can’t tell you how many times I’ve tried to merge onto I-95 and had to put on my breaks. When did they stop teaching people that the on ramp was there for you to speed up to match the traffic already on the interstate? Unless your car can go from 0-95 in 1 second, either speed up or stay off the interstates. Then there are the lane hogs. These are the folks that sit there in the right hand lane doing the speed limit. I admit it, I am not an angle on the roads. I consistently drive 5-10 miles per hour over the posted speed limits, but even this is not fast enough sometimes. In those cases, I move over to the right lanes. A word of advice to drivers out there, if the traffic is passing you on the right, either go faster or move over. It is well within your right to drive the speed limit, just get out of my way to do it. If I could have one wish when it comes to the drivers here in Virginia, Maryland, New Jersey, New York and D.C., its that watching the old Goofy cartoon about how to drive be a mandatory requirement to getting a drivers license. I haven’t seen it in years, but it must be around. It had a wonderful tutorial about why you leave a car length between your car and the car in front of you for every 10 mph you drive. 60 mph=6 car lengths. The space I leave in front of my car is NOT so you can get over and cut me off. If you really have to get over, put your turn signal on, I will let some more room open up so that you can cut me off safely. Leaving that space between you and the person in front of you isn’t an inconvenience, but a necessity. Not only does it give you time to stop in an emergency (avoiding accidents) it also allows people to merger (see paragraph 3) into traffic properly. I have wanted to vent like this for some time. I don’t believe the problem is that we live to far from where we work, its that no one learned how to drive in the area. Between the emigrant population that aren’t familiar with our laws, the teen drivers that don’t know what they’re doing yet, DISTRACTED drivers and folks that just don’t care, its a wonder that we get anywhere at all in this area. If this sounds familiar to you, please share your story. Maybe if we commiserate together it will make us feel better. If not, maybe the laugh will do us good. San Diego is similar. Although they just added some things to the freeway near my house and its not that bad anymore. This is a great post though.